When it’s warm and stuffy outside, nothing wakes me up more in the mornings than a refreshing shower. I do love a relaxing bath as well but I reserve those for the evening to help me to unwind and get ready for my beauty sleep! 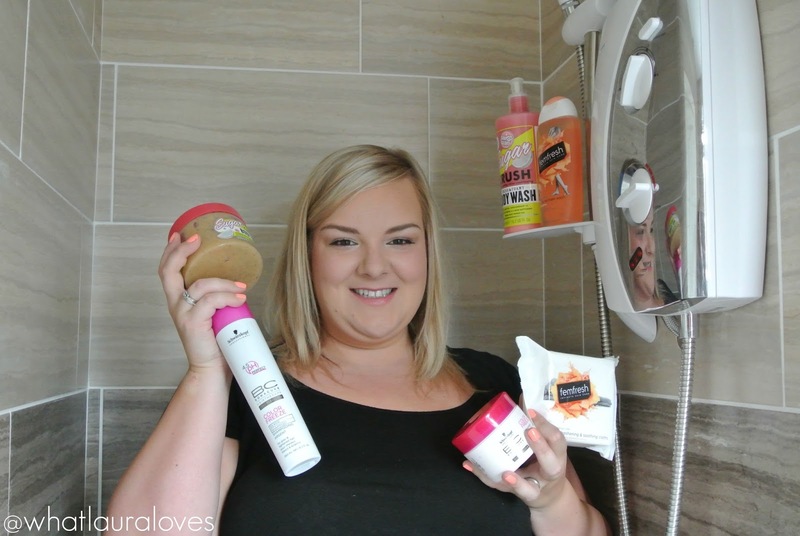 I’ve often reviewed the products that I use in my bath and shower but I don’t think I’ve actually put them all together to show you my routine before; so here it is, my shower routine and the products that I love to use. This year, I have really been focusing on growing my hair rather than relying on my much loved Great Lengths Hair Extensions. Part of this has involved leaving my hair as long as possible between washes, which isn’t difficult when I have my Batiste dry shampoo by my side and using a good shampoo and conditioner to do a lot of the work for me when I do wash it. I’m quite fickle when it comes to my hair products as I like to try different ones but they’ll always be either volumising or for coloured hair. I find that by using a shampoo and conditioner to help to volumise my hair, I need to use less heat on my hair to create body in it and less products in it. Generally speaking, I wash my hair every third day and the duo that I’ve been using at home most recently is from O’Right. 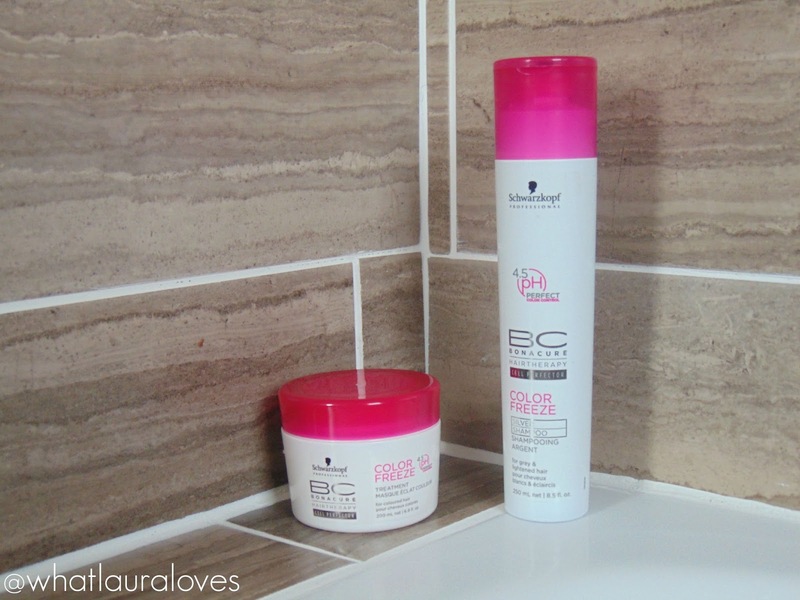 I reviewed their volumising range here but I prefer the new Recoffee line because I find that it is so effective at adding natural volume to my hair. To wash my hair, I use the O’Right Recoffee Volumizing Shampoo which cleanses my oily scalp effectively and adds plenty of volume to my hair without drying it out. That’s something that I have to be careful of as my hair is greasy but the ends are dry so I like to find a shampoo that doesn’t make my hair oilier or drier, which is often quite a task in itself. This shampoo is made up of 99.3% natural ingredients, including Recoffee Oil which is a natural antioxidant that is extracted from 100% recycled coffee grounds. It actually gives the shampoo a coffee scent that is a little strange to begin with, especially as it does linger in the hair, but I found that I got past that quite quickly, especially as the shampoo does work effectively. For such a natural based product, it does lather in the hair well thanks to the certified organic foaming agents that it has that don’t damage the hair but help it to be cleansed effectively, which is particularly welcome if you use a lot of products in your hair. It locks in moisture in the hair and gives it a great shine without overloading it and weighing it down. 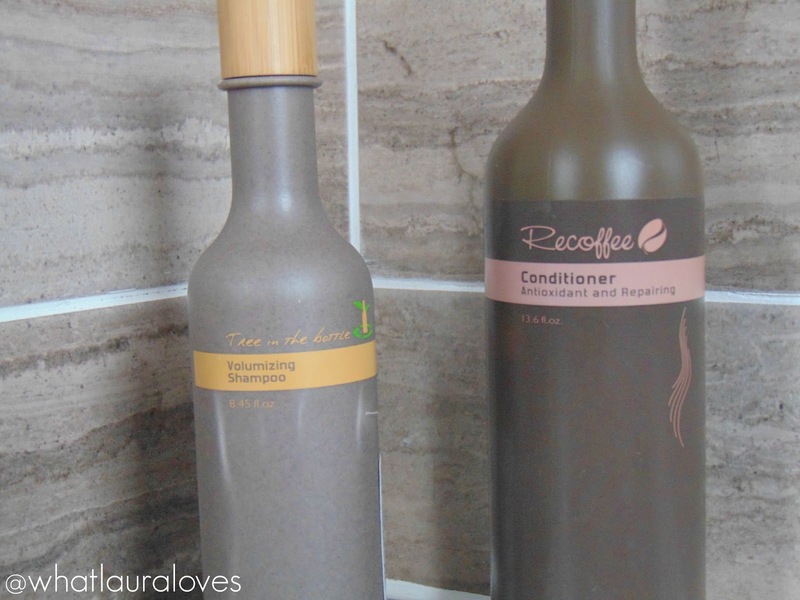 The conditioner from the Recoffee line works particularly well too. I use the Antioxidant and Repairing Conditioner every time that I wash my hair and love how nourished my hair feels after using it. It is never weighted down by this conditioner, nor does it get greasy more quickly. Like the shampoo, the O’Right Recoffee Conditioner is packed full of natural ingredients, including the Recoffee Oil and plant extracts to soften the hair, give it a healthy shine and boost hair volume. Not only are the ingredients natural but the bottles too as O’Right use biodegradable bottles made from corn-starch with bamboo caps and non-toxic soy ink. Every third time that I wash my hair, I like to refresh the colour and nourish it to protect the colour and strengthen it. My hair is blonde naturally but it is very warm toned. I’m not too much of a fan of the golden tones so I have light ash blonde highlights and ash brown low lights through it to give it a cooler tone. To keep it cool toned in between trips to the salon, I use the Schwarzkopf Professional BC Bonacure Colour Freeze Silver Shampoo. This highly pigmented purple shampoo effectively minimises the warmer, golden tones that run through my hair after only leaving it on for a minute or two. It leaves my hair feeling clean and looking very cool toned every time that I use it and the colour stays looking fresh and cool in between washing it with this and the O’Right shampoo. I’d really recommend giving it a try if you’re looking for a silver shampoo. To nourish my hair, I use a hair mask on every third wash. I tend to get into the shower, wash my hair straight away with the silver shampoo and then move out of the running water, ring my hair out and apply my hair treatment. Again, I am very fickle when it comes to masks and I like to treat my hair depending on how it is at that moment, whether it is in need of a volume boost, extra nourishment or colour protection, such as is the case at the moment as I’ve just had my highlights and lowlights done. The Schwarzkopf BC Bonacure Colour Freeze Treatment is fabulous for coloured hair. Aside from having a gorgeous sweet-like fragrance, it is rich, creamy and is so easy to work through the hair. I like to leave it on for about ten minutes while I complete the rest of the steps in my shower routine and then I wash it out under the shower. It leaves my hair feeling very deeply nourished and looking healthy. Plus it helps my low lights to last in my hair for longer thanks to the Colour Freeze formula that seals the surface of the hair, which adds a natural shine and long lasting colour protection. Regardless of whether its a hair washing day or not, I’ll always have a morning shower. I find that it wakes me up and sets me up ready for the day. The exception is if I’m going to the gym first thing, in which case I’ll shower there. 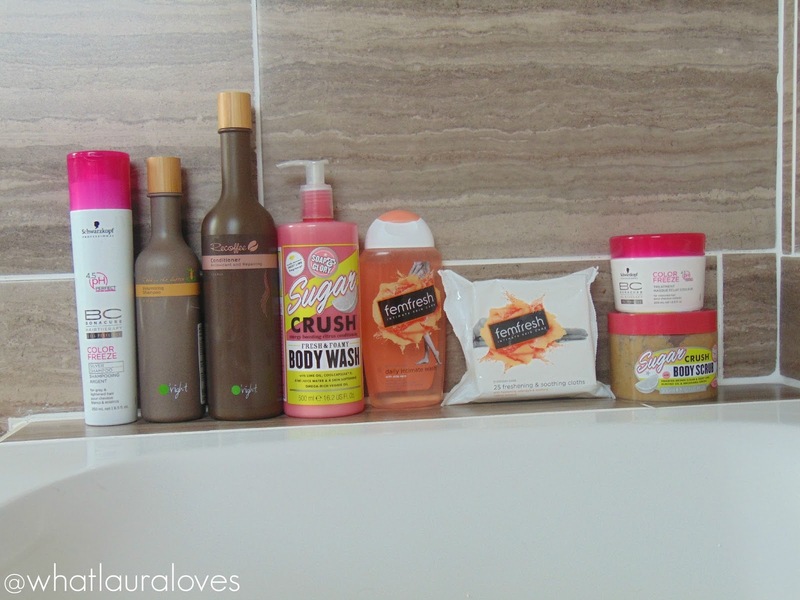 I’m sure you’ll not be surprised to see that the Soap & Glory Sugar Crush line features heavily in my everyday shower routine. While I do try out other shower gels when I’m travelling or at the gym because I like to take smaller sized products with me, their Sugar Crush Fresh & Foamy Body Wash is the product that I have used almost exclusively since the beginning of last year because it keeps me feeling clean and smelling gorgeous for a long time. First of all, it smells incredible, just like key lime pie and second of all, it does the most fabulous job of cleaning my body without leaving my skin feeling tight and stripped of all moisture. It has a creamy consistency that not only feels hydrating on the skin but it does a great job in place of a shaving gel too. If I’m shaving my legs in the shower then I’ll often just wet my body, apply my shower gel all over as normal and then shave my legs and I always get a very close, smooth shave with it. At the moment, I’m busy trying out some Nair waxing products that I’ll share the results of with you all very soon, which is why a razor doesn’t feature in my current shower routine but if it did, it would be used with this shower gel. I’ve tried out most of the Soap & Glory shower gels and they all do more or less the same thing, so I’d recommend picking the one that you like the smell of the most. The Sugar Crush fragrance does linger on the skin after use so you need to like it if you want to use it! The same goes for the Soap and Glory Sugar Crush Body Scrub which is the next step in my routine. This super gritty scrub has featured on my blog so many times over the last couple of years as it really is my favourite of all time, partly because of the scent but mostly because of how effectively it buffs my skin. Especially at this time of the year when I’m trying to maintain my summer holiday tan for as long as possible, exfoliating my skin every two to three days is really important. I like to wash all of my shower gel off and then turn off the shower and buff the body scrub onto my skin in circular motions before washing it off. I use it all over my body, except my face of course and find that it leaves my skin looking very moisturised with a gorgeous healthy glow and not a scaly, flaky patch in sight! 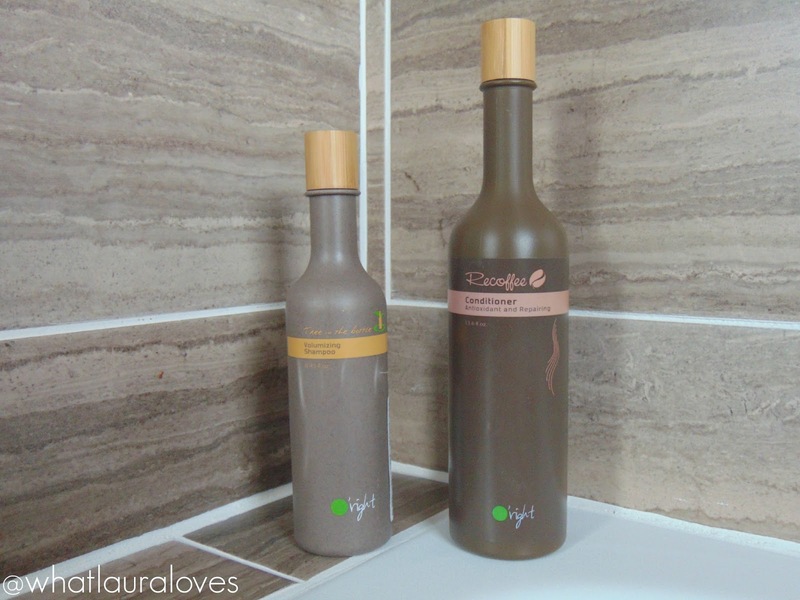 For a full review of this body scrub, have a read of this post. Using the femfresh Everyday Care Daily Gel Wash is the last step in my everyday shower routine and it has been for many years. I’ve used, and often reviewed, a lot of the femfresh range on my blog as they’re just as much of an essential part of my shower routine as shower gel and shampoo. I first started using their products when it was that time of the month and loved the clean feeling it gave me and I’ve remained loyal to the range ever since. There are a few different varieties available but they all do more or less the same thing, keeping you fresh and clean, with only subtle differences between the different varieties. At the moment, I’m using the wash from the new look, Everyday Care range. I save using the femfresh Daily Intimate Wash until the last step in my skincare routine because it helps to maintain the natural pH balance of the skin in intimate areas. Intimate skin has a lower pH level which is different to the rest of the body and usually, it doesn’t matter how resilient the skin on your body is, the chances are you’re going to be very sensitive and prone to irritation down there. Lots of things can irritate the natural pH balance of your delicate, intimate skin from the underwear you’re wearing if you’re hot and sweaty at the gym to the medication you’re taking and whether you’re on your period. The shower gel that you’re using can also cause a lot of discomfort and irritation, especially if it’s heavily fragranced. Anyone who has ever used the Original Source Tea Tree and Mint Shower Gel will know exactly what I’m talking about here. Since the Soap & Glory Sugar Crush shower gel is very heavily fragranced, I like to use the femfresh Everyday Care Daily Gel Wash afterwards to wash with so that it will neutralise the pH level of my skin. As with all femfresh products, this gentle gel has been dermatologically and gynaecologically tested and certified as being suitable for use everyday. The formula is soap free so it doesn’t dry out my skin and it contains aloe vera which will soothe and calm irritated skin as well as helping to leave the skin feeling cleansed, soft and moisturised. The daily wash itself doesn’t have a strong scent to it but it leaves your actual body feeling fresh and clean. Plus it banishes any unpleasant odour. You can actually use it all over your body as the formula is so gentle which I have done on a number of occasions when I’ve ran out of my usual shower gel or when I’m trying to take fewer products with me to the gym or on nights away from home. On an everyday basis, the femfresh wash keeps me feeling fresh and clean all day long but on days where I’m rushing around out and about or cleaning the house, I like to have the femfresh Everyday Care Freshening and Softening Cloths on hand to freshen up if I need to. Especially being bigger, I find that I can get hot and sweaty quite easily so I always like to have a pack of these and a deodorant in my bag to stay smelling and feeling fresh while on the go. It helps me to feel confident! The cloths come in a 25 pack like I have here or in a smaller size that is perfect if you’re travelling or only have a small bag with you, perhaps at a festival or something like that. I found them particularly handy when I went on safari to Kenya as some of the washrooms weren’t as hygienic as I’d have liked. That’s the great thing about the femfresh Everyday Care Freshening and Softening Cloths because not only are they great at refreshing your intimate skin throughout the day but they’re handy for having in your bag when you’re out and about incase you have to use a bathroom that doesn’t have any toilet roll or doesn’t look particularly clean. Like the wash, the wipes have a pH balanced formula too and are infused with calendula and mallow extracts to cleanse, freshen and soothe the skin. They give the skin a long lasting feeling of freshness which is especially welcome after I’ve been to the gym. Sometimes I’ll head to the gym in the early evening or I’ll do a class on the afternoon and I like to fresh and clean afterwards. I don’t always have time to have a shower, especially if I’m running errands so I’ll use one or two of the femfresh cloths on my intimate skin and under my arms, spritz on some deodorant and give my hair a spray of Batiste and I’m good to go until I have a bath that evening. 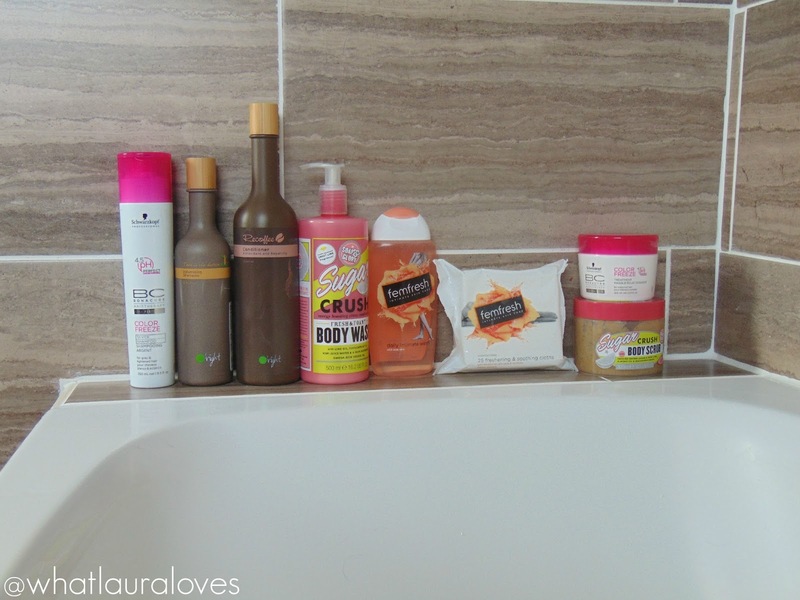 That’s it for my shower routine and I’m sure you’ll agree that its pretty simple, focusing on cleaning and conditioning both the hair and the body with products that are designed specifically specific areas. You’ll notice that a lot of the products in this post are ones that I’ve used for years or at least from the same brands, as while I do like to try out new products, when I find something that works for me, I like to stick to it. I always know if I love something because I’ll buy it again and again and again! I’ve posted lots of skincare and body care reviews on my blog but if you’d like me to share my post-shower routine, hair styling routine or anything like that then do let me know in the comments and I’ll make a note to write about that soon! What products do you use in your usual shower routine? *this post has been kindly sponsored by femfresh. All opinions are completely my own, although I’m sure I don’t have to say that as regular readers will know how much I love and use their products. For more femfresh reviews, check out the search bar on the right. Previous Post Yours Clothing Metro Centre Re-Opening! Loving the sound of the Soap & Glory shower gel… I must give it a try to perk up my morning shower routine. I've been using a mango shower gel recently, but the scent quickly fades once you're out of the shower. I really need to try Soap & Glory. I've heard nothing but amazing things about all of their bath products, especially their scrubs. This summer I was actually trying to avoid using scrubs so that I could keep my tan longer! I guess I should be doing the opposite. Thanks!